Back in 2014 when I was a couple of years out of Uni and on the look out for illustration jobs, I came close to drawing cartoons for a book that explained physics entirely through jokes, the book wasn’t picked up but I kept in contact with the author, James Colley. James and I met through different university comedy societies, James continued writing and I kept drawing and we both marched forward without losing our comedy roots. Nominated for a Young Walkley, creator of SBS Comedy’s The Backburner and Nailed It at Giant Dwarf, James also works on ABC TV’s The Weekly: with Charlie Pickering and Gruen. James has his teeth well and truely sunk into the Australian political satire scene and in 2017 released a book as his right-wing political commentator character, Peter Chudd. 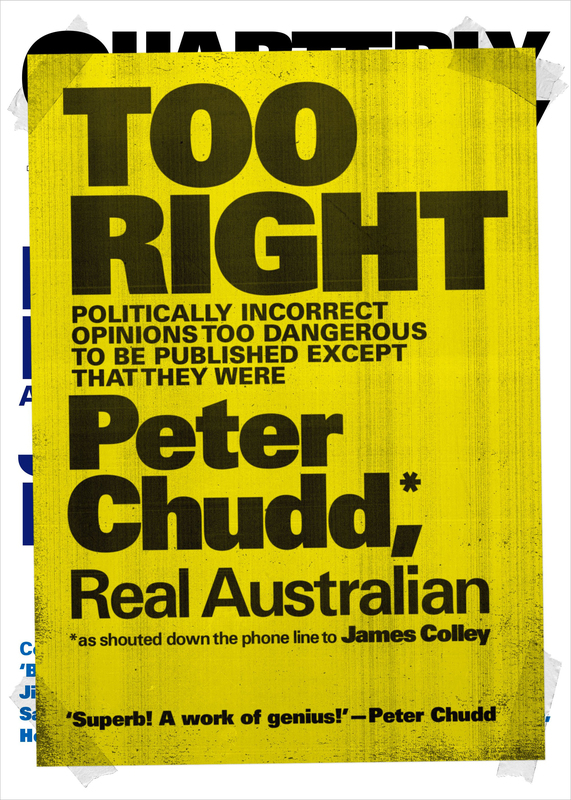 The book: TOO RIGHT – Politically incorrect opinions too dangerous to be published except that they were by Peter Chudd*, Real Australian (*as shouted down the phone line to James Colley) should have a shorter title and more chapters. It was a snort to read and I wanted more, so while reading the last chapter I asked James if he would sit for me for a portrait as Peter Chudd. 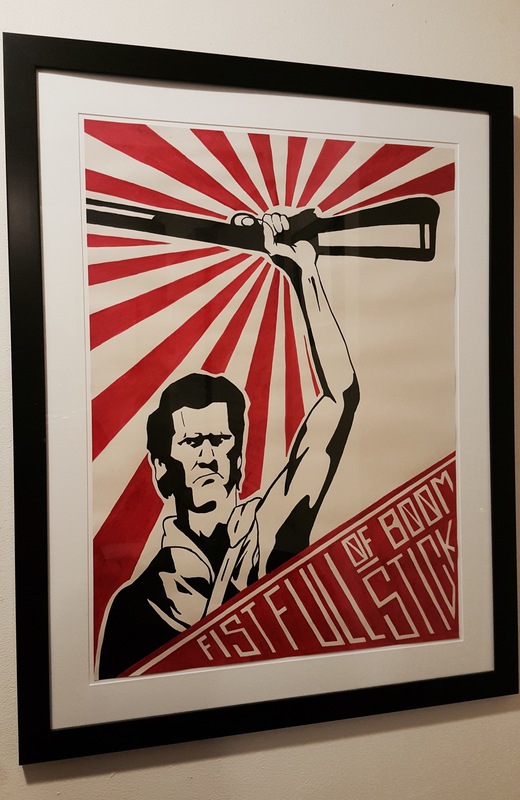 Chudd is the kind of character that would assume artists would be chomping at the bit to paint his likeness and would also assume that if the portrait wasn’t picked as a finalist in the Archibald Prize it would somehow be an infringement of his god-given free speech. 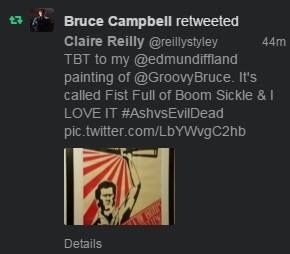 Often portraiture, and portraiture in the Archibald Prize have paintings that are based on a previous portrait or artwork from history. My portrait of the Umbilical Brothers two years ago was based on a Raphael portrait called “Madonna of the Goldfinch”. My artwork used the physical position of the two central figures and surrounding background as a reference – it was named “Umbilicals of the Goldfish (after Raphael)”. By referencing a historic portrait it elevates your own art and draws a thematic line between your subject and the one being referenced or the original artist. For the portrait of Peter Chudd (AKA James Colley), I borrowed the expression and physical pose of Velázquez’s portrait of Pope Innocent X. It is notorious portrait also famous for being reproduced by Francis Bacon in his Screaming Popes series. By painting Chudd in this way I am portraying him as a pious stern character, a man of great power. I saw the painting at the Doria Pamphili Gallery in Rome two years ago and is a fiercely personal and true portrait. “Troppo vero!” is what the pope exclaimed when he first saw Velázquez’s portait, this translates to English as “all too true” you could say it translates to Australian as “too right”. So I named the artwork “Troppo vero!” (“too right”) Portrait of Peter Chudd (after Velázquez). But I felt the portrait itself needed an element of performance. Earlier this year on January 26, a statue of Captain Cook in Melbourne had a bucket of pink paint poured over it as part of the #changethedate protests. This was an event that fuelled so much outrage for right-wing political commentators. 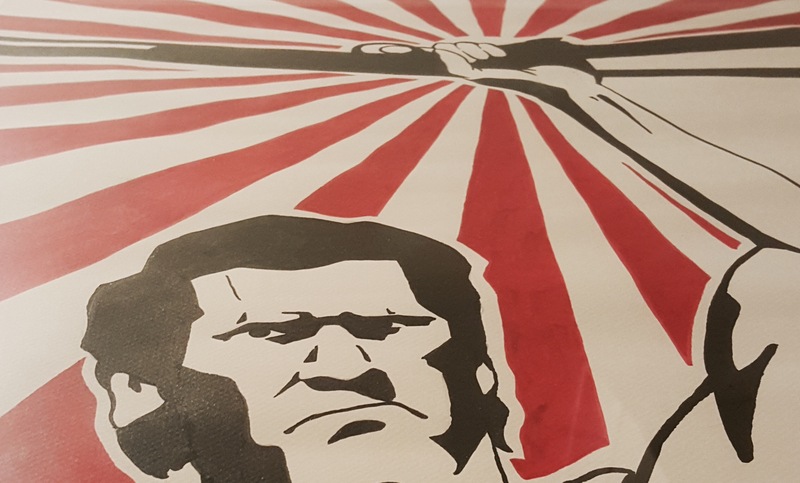 The pink paint that is poured over my portrait of Peter Chudd would have him screaming ‘censorship’ and the event on Jan 26 would easily have been a news article he would hammer for weeks blaming the ‘intolerant left’ for their disrespect and violence. James has been wonderful and energetic through the process and is an all round nice dude. It was great to finally collaborate with James and on the year I scored a gig as a political cartoonist (goat.com.au), James Colley was the perfect person to paint. 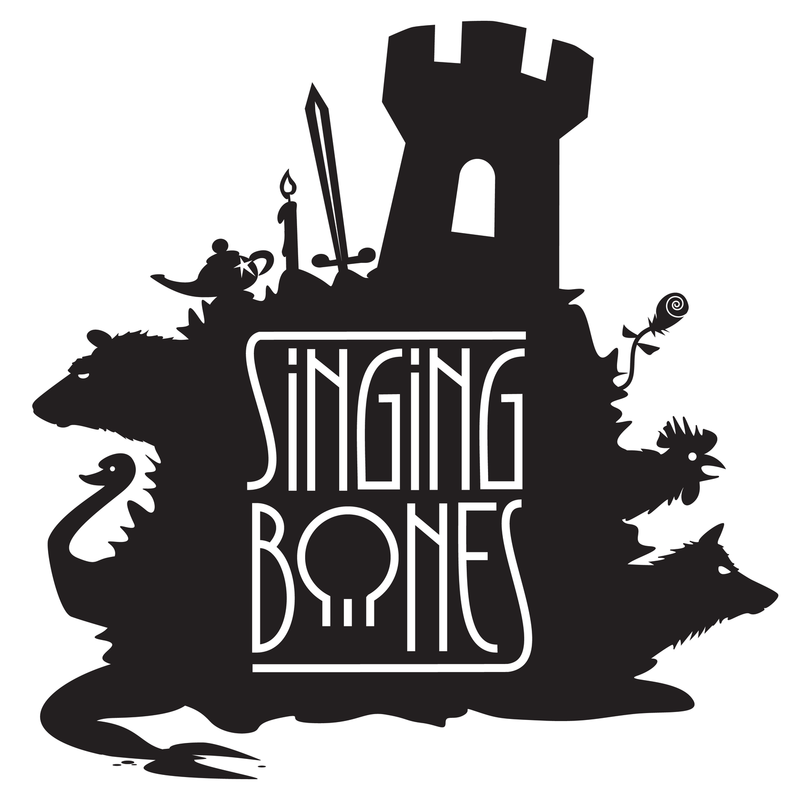 Singing Bones is the perfect podcast for anyone with a keen interest in literary history, story telling or anyone who just wants to know how many magic beans you should really get for the family cow. 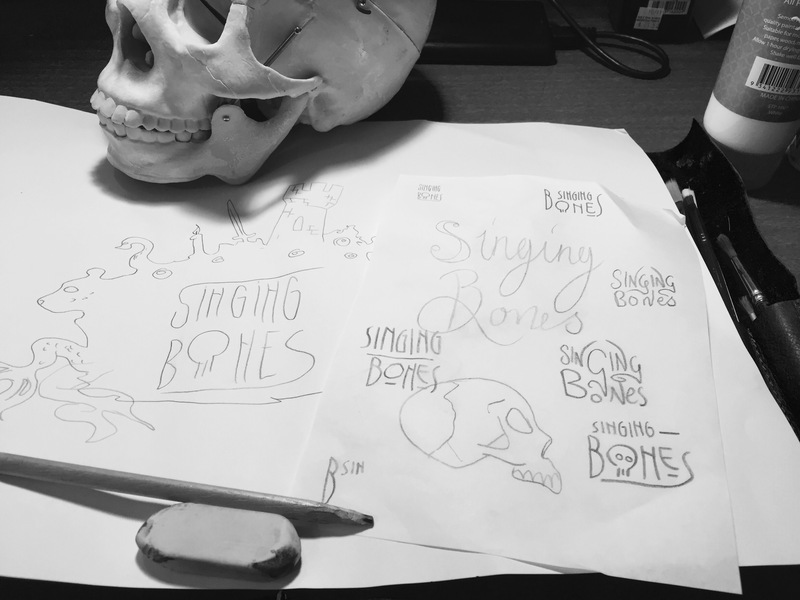 This week I completed the new logo design for the Singing Bones podcast which is written and read by Clare Testoni. When chatting to the podcaster, we discussed all the artworks and stories that influence this project and what the logo should convey. The logo was inspired by Clare’s love for, and work with paper cut shadow puppets and could almost be a Lotte Reiniger Rorschach ink blot test. Testoni’s love for the history of fairy tales makes for an exiting listen. These stories that are so familiar and almost always a part of everyone’s childhood differ vastly depending on location and language. Communicating visually and being iconic. After celebrating my three year anniversary with Jigsaw I had a looked back at some of the designs I’d created and the skills I have learnt. 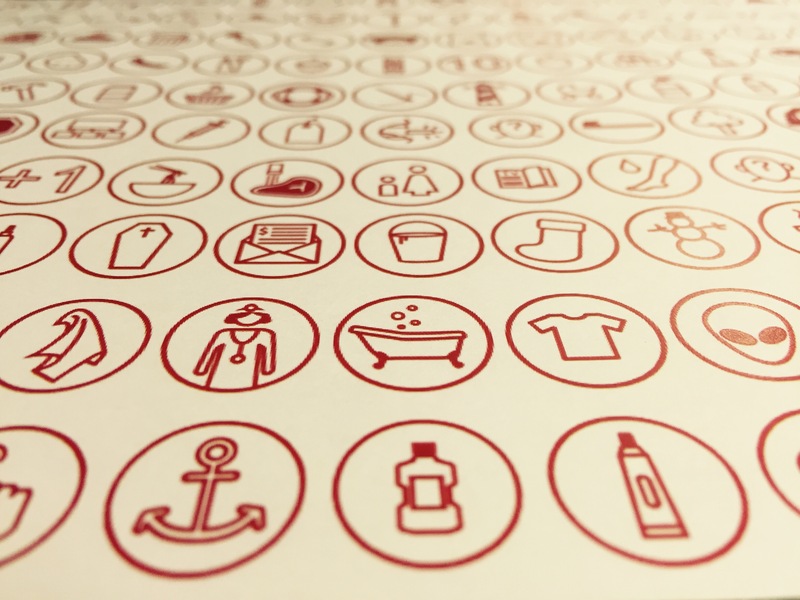 One of my most constant design challenges was creating simple icons that have been peppered through our presentations. After Jigsaw had a rebrand 3 years ago by Christopher Doyle & Co. we had a clean and crisp new design direction, as part of that design Chis created about ten icons to use in our presentations with the plan for me to create more as time went on. 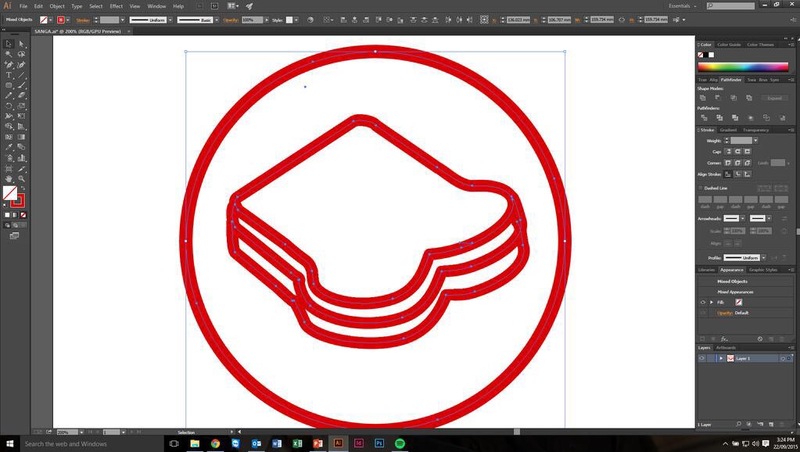 Over the past three years I’ve been busy in Adobe Illustrator morphing the same 14pt red lines into soup cans, unicorns, anchors and basketballs. At the moment the icon count sits at 861. This work has been great for my creative practice as it has taught me to think about how to communicate simply and directly while maintaining a strong aesthetic – A skill which is very valuable in cartooning. My cartoons have become clearer and more focussed which in turn has made them funnier as the reader is able to digest the joke in a shorter amount of time. Well all this hard work has made me hungry – I’m off to make a sandwich. Every dog is supposed to have his day, but some get neglected, rejected and fall victim to abuse. 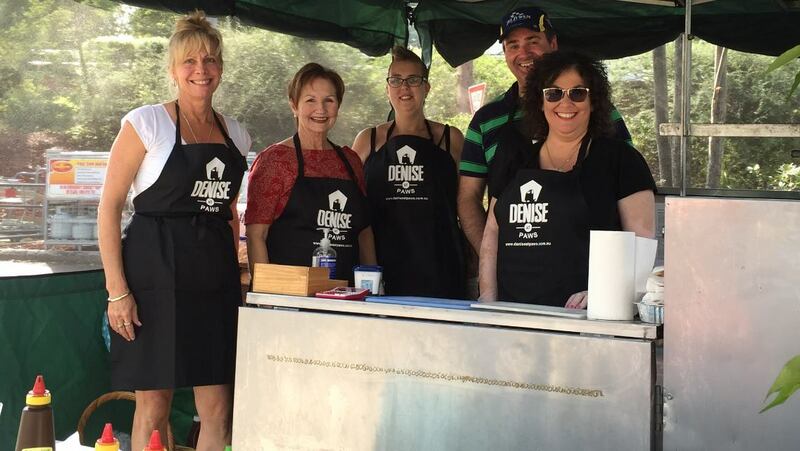 To ensure dog’s to get their day Denise At PAWS is a little non for profit that helps dogs that are down on their luck find a home. I put my hand up to help D.A.P fight the good fight and created their new logo. The simple pentagon seemed like a perfect home-shape to frame the dog character. It speaks directly to the work they do and gave me a great opportunity to work with typography and simple character design. 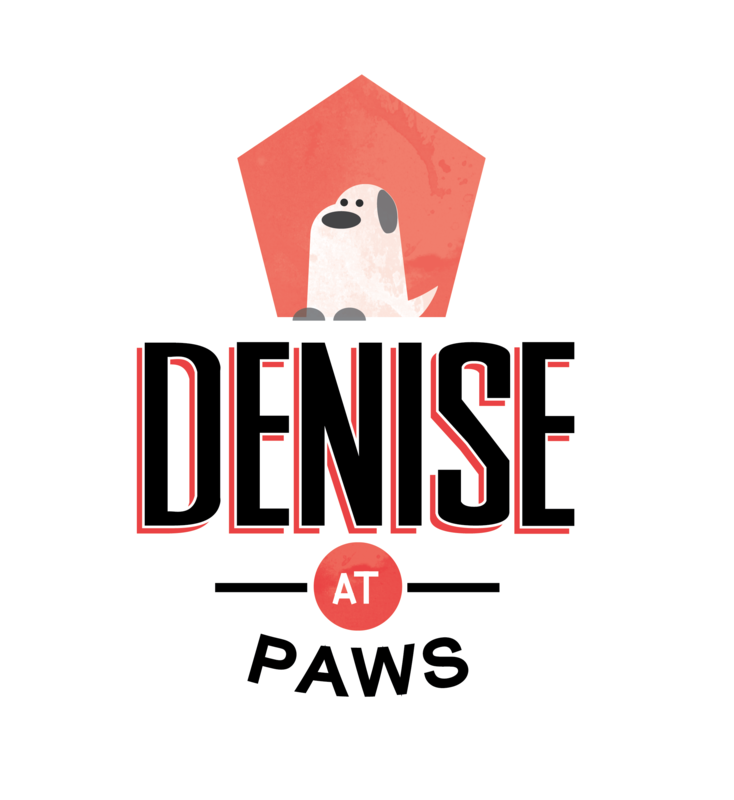 Through Denise At PAWS you can adopt a rescued dog or foster one until it can be adopted to a new family. Some of their dogs have been seen on Bondi Vet and they are always looking for donations to continue their work. Even if you can’t give a dog a home you can spare a few dollars surely. Click here to donate. if you can’t make it to a Bunnings barbeque.